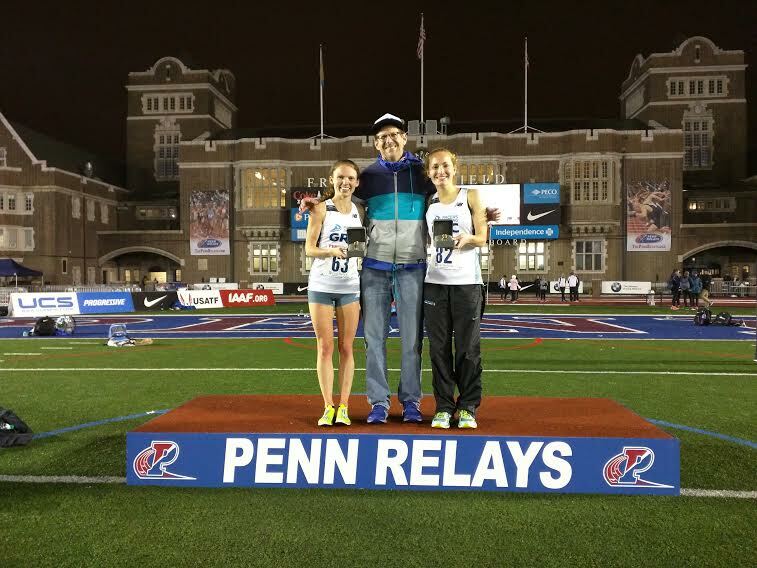 It was a huge weekend of racing in Philadelphia, with several great performances at Penn Relays and Broad Street 10 miler. 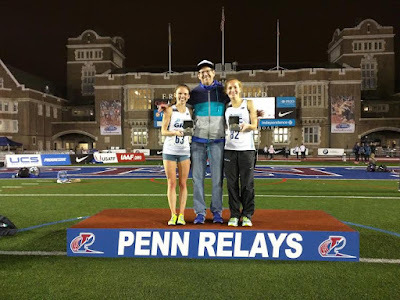 At Penn, a GRC athlete won an Olympic Development championship for the 3rd consecutive year, and this year we decided that we enjoyed winning so much that we did it twice. Frances L got the evening started with the win in the 5,000, running a very strong 16:50, which is third on the GRC all-time list. Frances had a very promising indoor season, but a nagging injury forced her to start her outdoor season several weeks later than we planned, and she is still not fully fit, so to win a Penn Relays title when she's not at full strength is a great sign of things to come. Steph finished the night in style, winning the 10,000 in an outstanding 34:12, which is second on the all-time list. Steph did it the hard way, leading for at least half the race, and she ran a huge negative split (17:16/16:56), which shows she could have run faster in a more favorable race. To put into perspective just how well Steph ran, until this year, the good folks at USATF had a B standard for the Olympic Trials, which was 34:00, so Steph is now running on a national class level. And to put into perspective just how far she has come in a very short time, her PRs prior to joining GRC in the fall were 17:59 and 37:31, so it's fair to say that she's improved a fair bit in the last year, and Coach Jerry has every expectation that she's just scratching the surface of her ability. The guys also got after it at Penn Relays, and Stewart ran a huge PR of 14:49. Stew was on 14:40 pace for 4k, but the uneven early pace, and the energy he expended jostling with the very large, physical pack caught up to him in the last 1000. He still managed to close hard in the last 200, and he was rewarded with a major breakthrough. It was a tough night for Phil, but he's going to shake it off, and we'll see some excellent performances from him this spring. At Broad Street, in conditions that were sub-optimal, to put it mildly, Kerry ran a huge PR of 58:57, which puts her third on GRC the all-time list. Kerry has been ready for a major breakthrough this spring, and when she was unable to get it at Cherry Blossom due to the weather, Broad Street became the target. A nagging injury put Broad Street into doubt, but Kerry worked through it, and got the job done in a major way. Carlos ran a very strong 49:47, which puts him third on the all-time list. CJ has big goals for the spring on the track, and the strength he's building by running longer races on the roads will translate well to the shorter distances. Finally, Chris ran a big PR of 53:31, and he continues to show great promise as he makes the adjustment to competing on a high level. In non-Philly action, Charlie ran a strong 1:13:50 in the Pittsburgh Half Marathon, in rough conditions. Charlie has been training well, and he's going to be ready for a major PR in the full at Grandmas. Finally, Outlaw got the win in the Draft Day 5k at the stadium of Washington football team.